sorry I sort of dropped off on my posts again. I am going to share a few today all in one post. This one was fun. 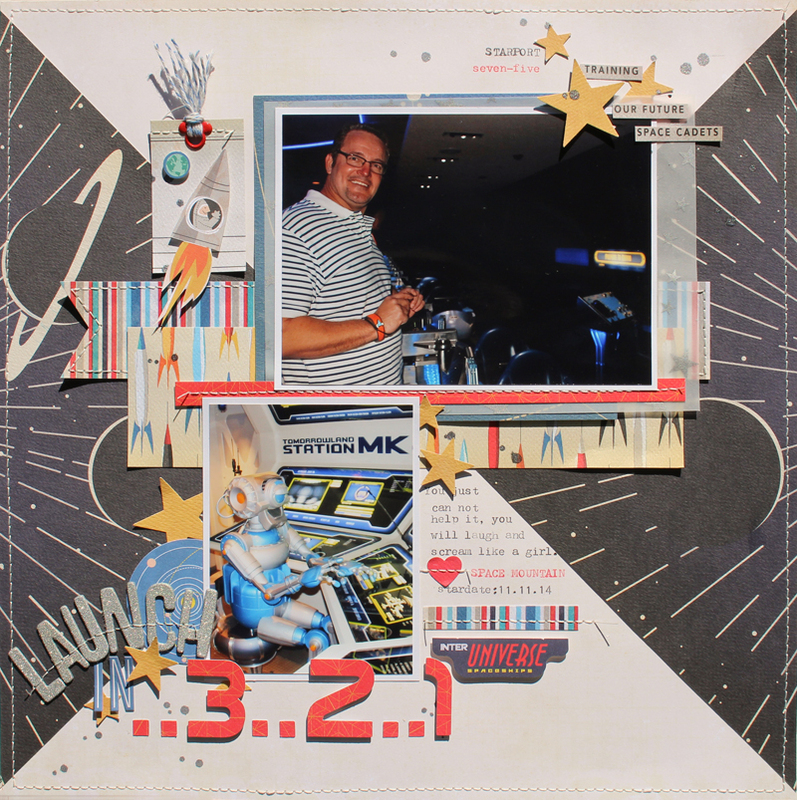 I was totally inspired by a friend's digital layout. 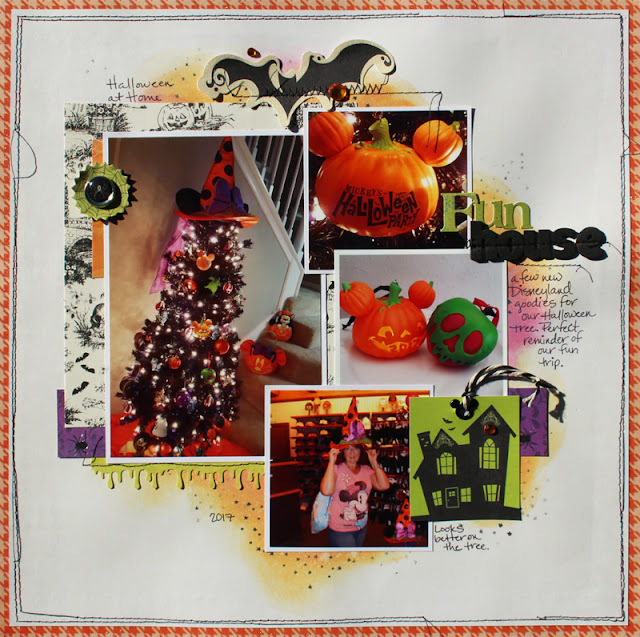 I used some Ranger Distressed Oxide inks and papers from some older DCWV Halloween stacks. The next one is using the January kit from the Hip Kit Club. Also using that same January kit, some sugar skull picks that a friend gave me, and a lacy paper from DCWV. When I got to spend the week at Disneyland with my Disney girls squad, we dressed for Disneyland Halloween and went to Mickeys Halloween Party! It was so much fun that I can not wait to do it again! If you ever get the chance, you have got to dress and trick or treat! 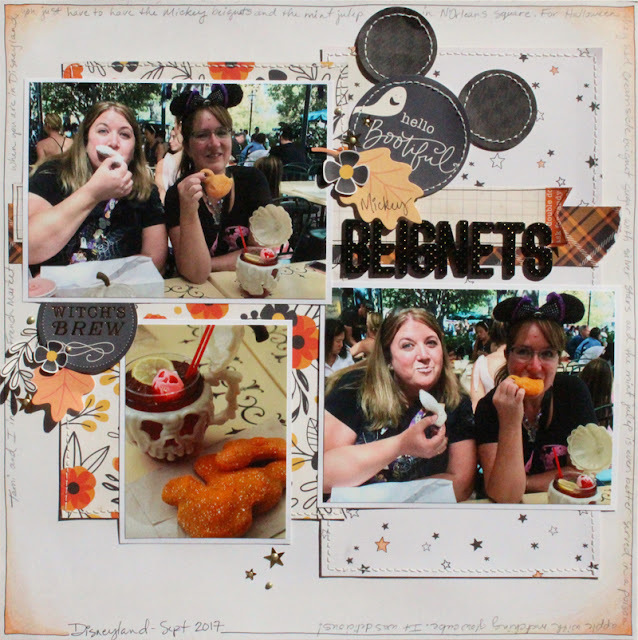 This first page is us in New Orleans Square having the famous Mickey Beignets and for halloween they had Orange Creamsicle with silver stars. omgosh so yummy! The star paper is from Crate Paper Carousel and the other papers are from Pebbles Midnight Haunting. LOVE that collection. so since I LOVE coloring, I have lots of colored pencils from Crayola, Prismacolor, and Polychromos. 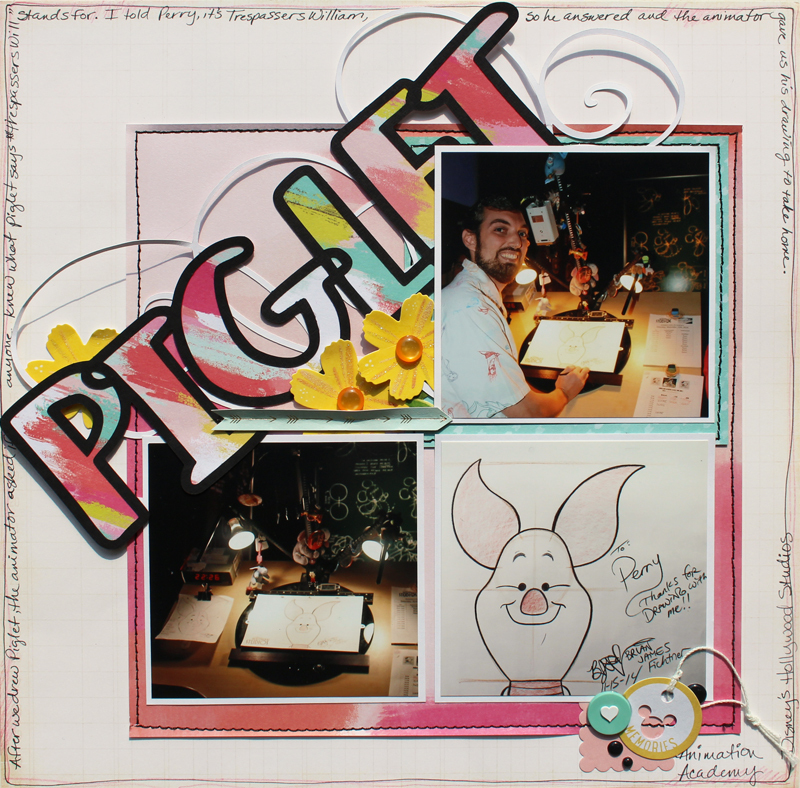 I thought it would be a waste not to use them in my scrapbook so when I drew the pen line around this page and journaled, I decided to use my colored pencils to add some shading to the corners. The Crayola pencils are kind of not good for coloring except if you want a really really light color for shading so they are perfect here. 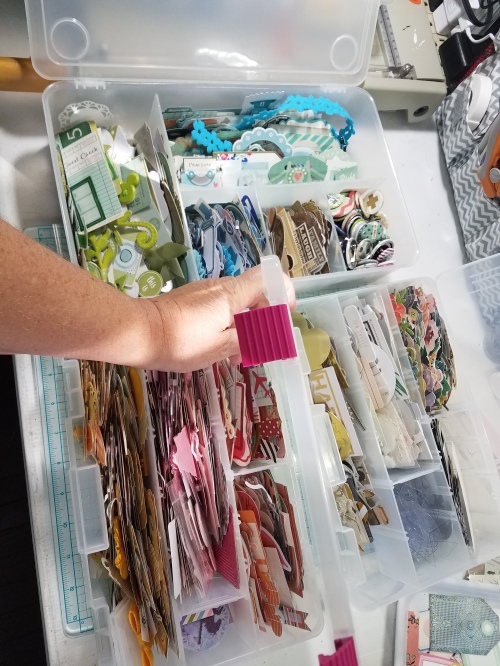 Plus they are super duper cheap and have a 50 or 100 pack if you want to add a fun thing to your stash. 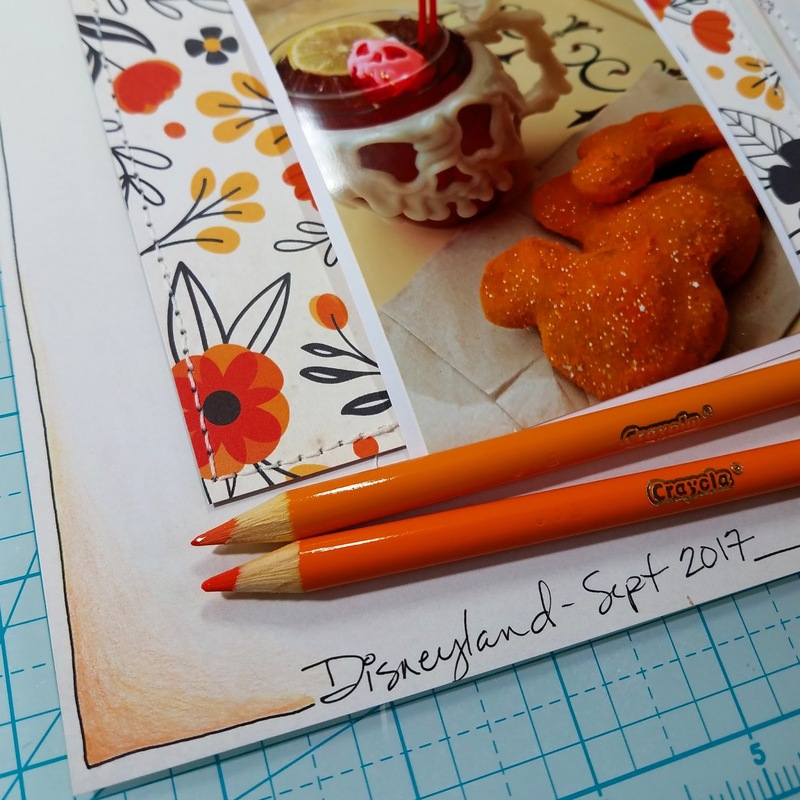 This next page was for a DisneyScrappers sketch and it incorporates an exclusive halloween cutfile too. I used Echo Park HalloweenTown papers. 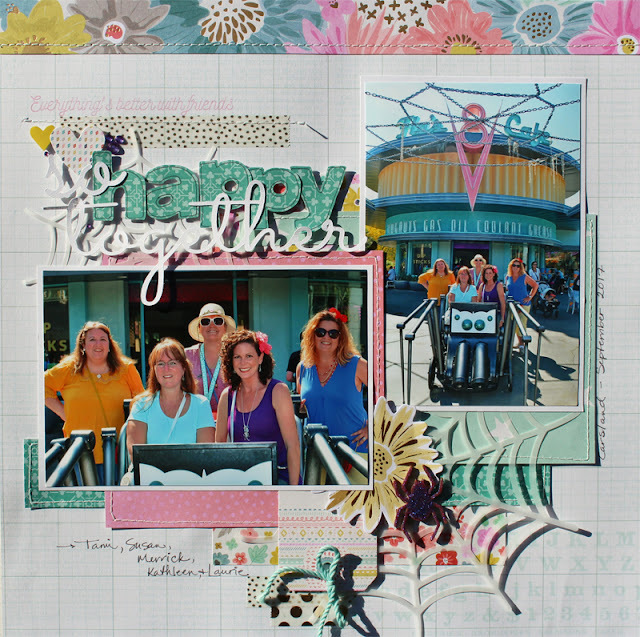 I used a stamp background from Echo Park in the background and added some green splatters and purple rhinestones. Yes the spider does have mouse ears! I hope everyone had a wonderful Easter weekend with family and friends. 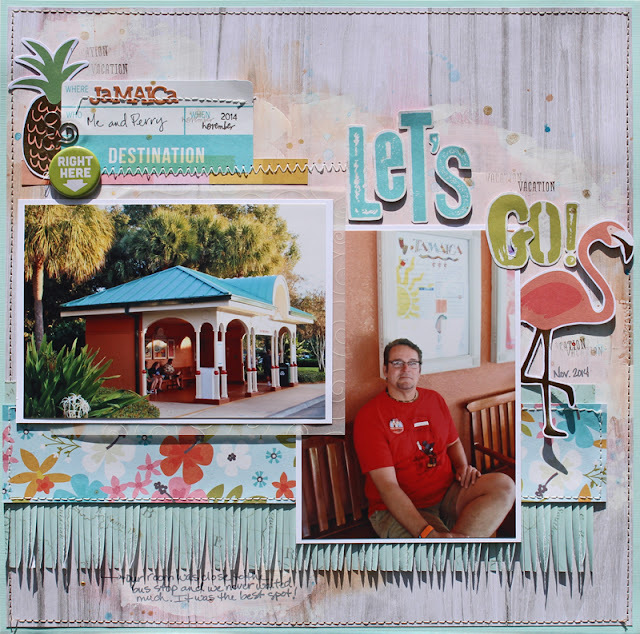 This layout was for a scraplift challenge. 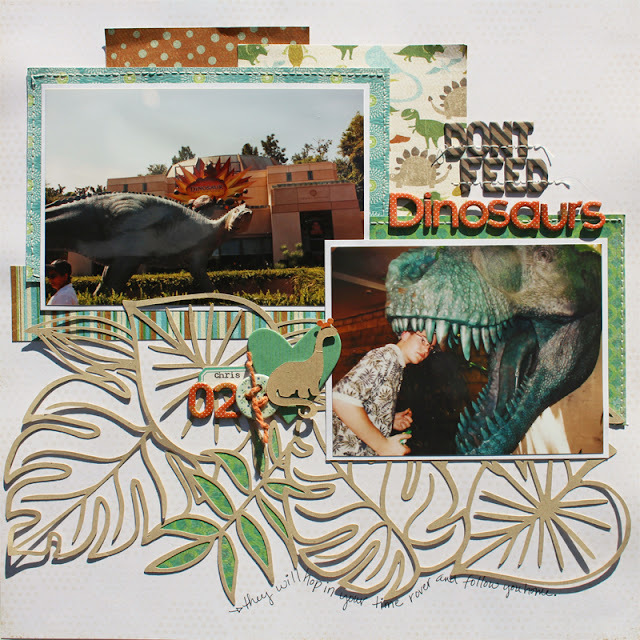 I saw a layout that I loved by Emma Wood on Cocoa Vanilla and recreated it a bit with my photo and mostly papers from Paige Taylor Evens Turn the Page collection. 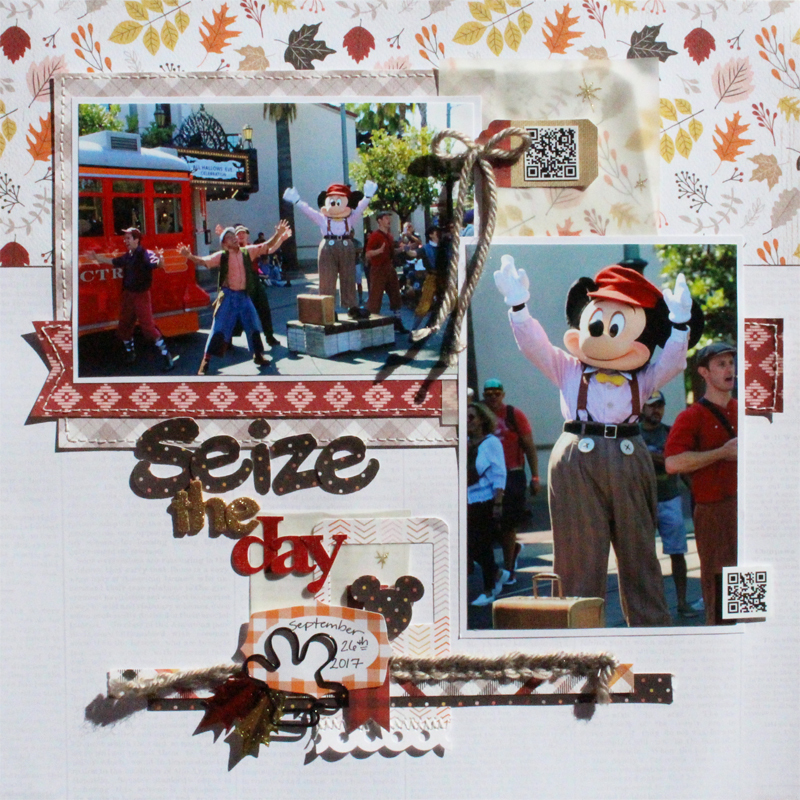 This is a fun way to use a bunch of patterned papers. These photos are from the Red Car show at California Adventure. Carta Bella Hello Fall matches this show so well! I wanted to add links to Tami and Kathleen's videos of the show so I created QR codes that can be scanned with any phone. If you don't have a QR/barcode scanner on your phone, the app is free. you are welcome to scan my video to see clips of this cute show. Another fall themed page from California Adventure. 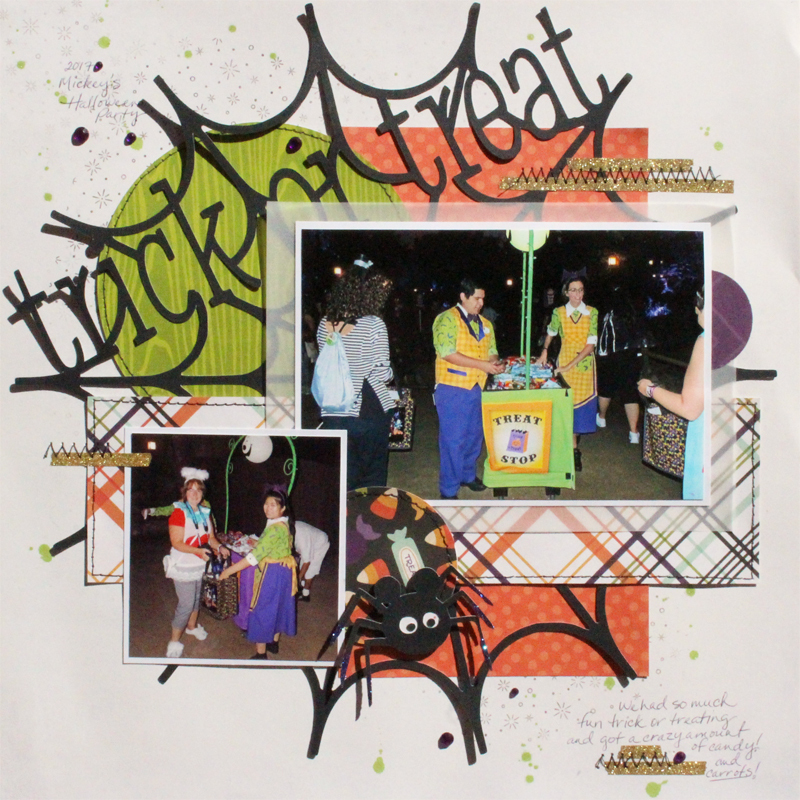 The new Haul-O-ween decor at Carsland is amazing but seriously, all that detail! I will be scrapping tons of the details. 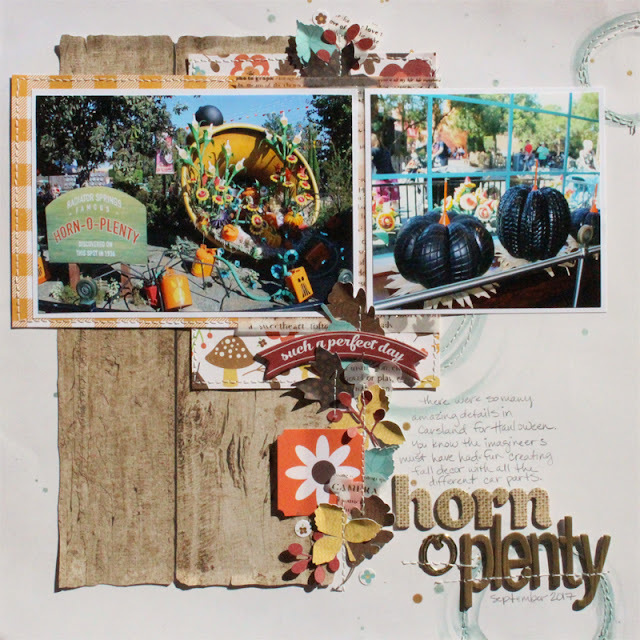 This is one of my faves, the Horn o plenty is a giant horn that is being a cornucopia and the stuff is all car parts. 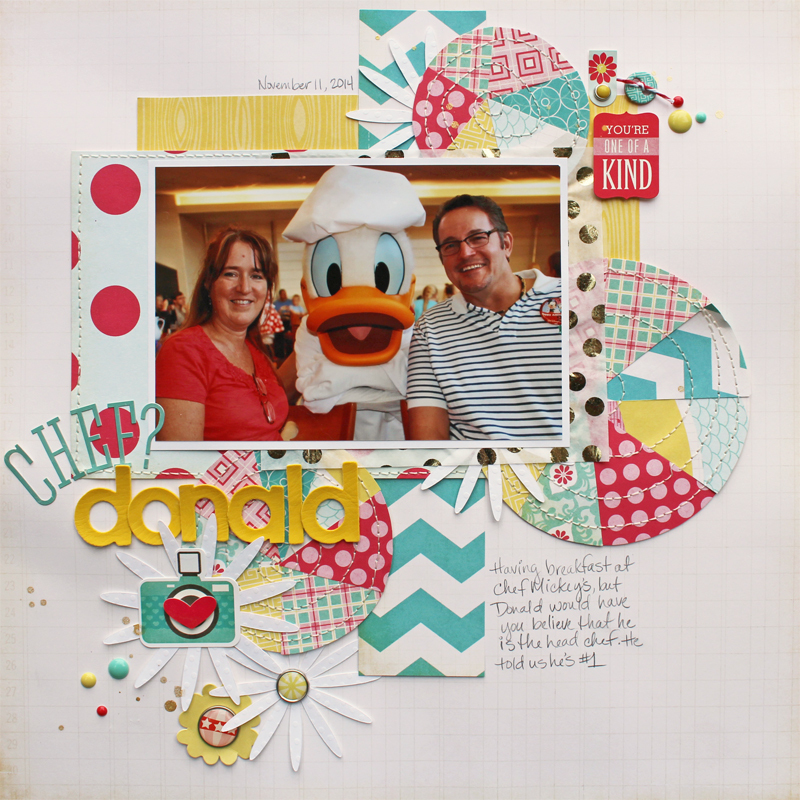 Today I am going to share several layouts. For this first one, it was my birthday and our anniversary so pooh and friends gave us 2 cupcakes, signed cards, and told me to make a wish. I used MME papers and the doily is a Prima die. 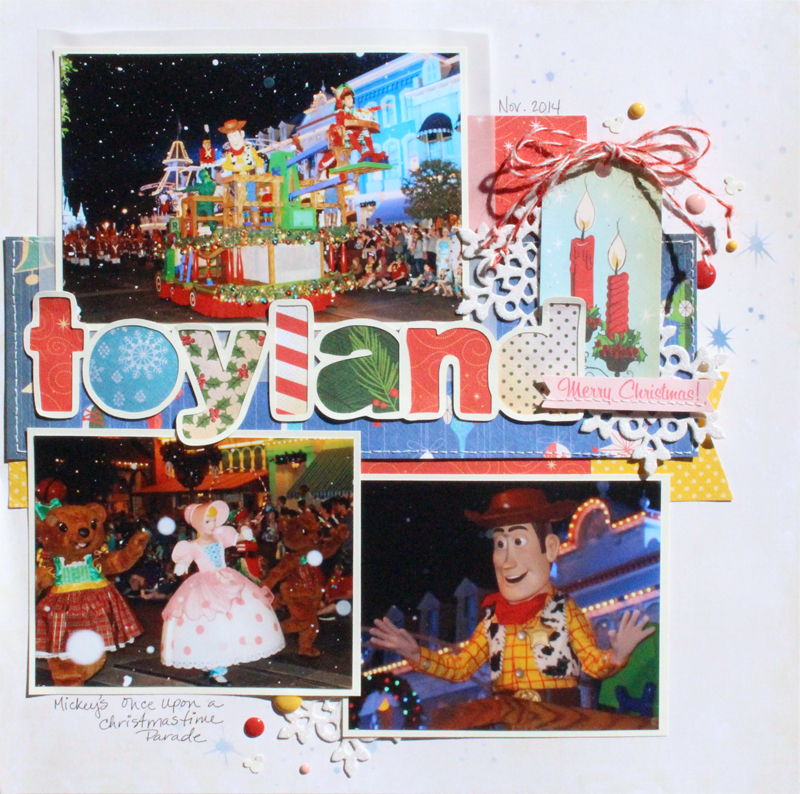 The third layout is photos of my sister and I at Disneyland in 1996. I used Twinkling H2O watercolors behind some of the circles. I didn't measure out where to put the circles so don't expect that these line up :) The photos are me and my sister in 1996 I believe, but I wrote 97 so I have to fix that. and lastly is a layout from the Very Merry Christmas Party Parade. I used Echo Parks A Very Merry Christmas collection and the colors were just what I needed for the parade. 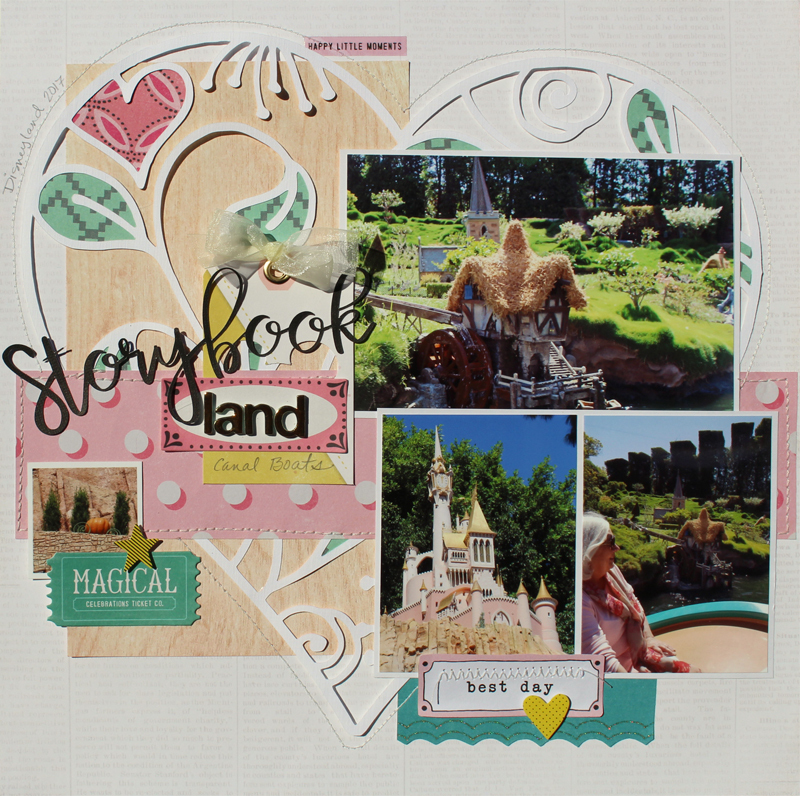 I am sharing a few very quick layouts today. This was the last time we got to ride The Great Movie ride before it was closed. 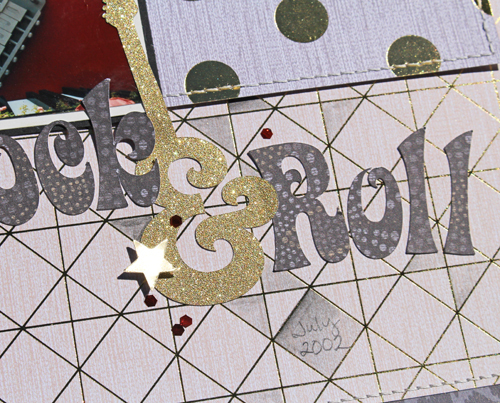 I cut the background cut file from an ivory pearlescent paper to just add a bit of texture. 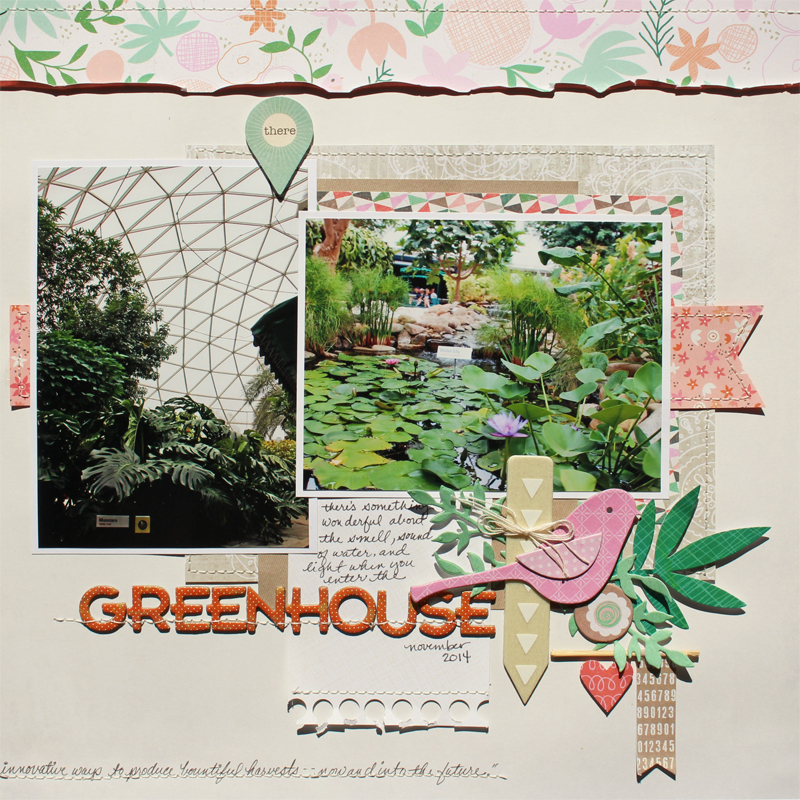 This is my page for the August sketch and I used some super old Echo Park from my stash. The page warped pretty badly since its thinner paper for the background but it will flatten in my album. This is one of my very fave moments when we were there with the boys the first time. Alex was 10. First day arriving, we checked in and hopped on the bus to DD and Alex turned to me and said, "I cant believe I'm finally here" I didn't have a photo so I took a screenshot of the video that Perry was taking at the time. I used Maggie Holmes Gather collection mostly. The background is a cardstock called vanilla but its kind of pink so the white gesso shows up well. I just journaled in pencil so it wouldn't be overwhelming. 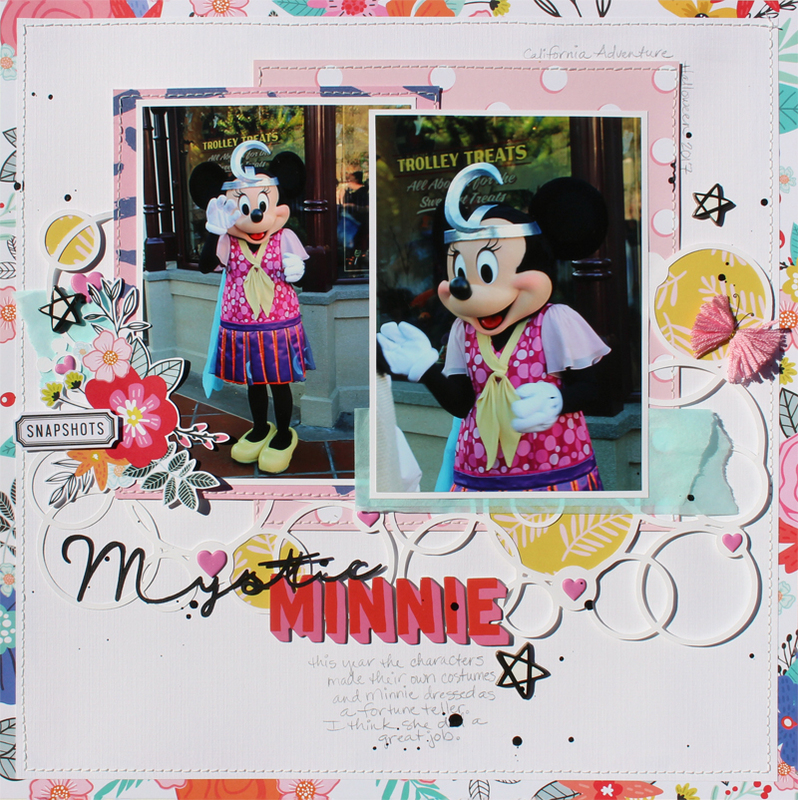 For this first page I used Pink Paislee papers and printed a June White Glove exclusive Printable image at Disney Scrappers. I printed on watercolor paper and used watercolors to paint the flowers. 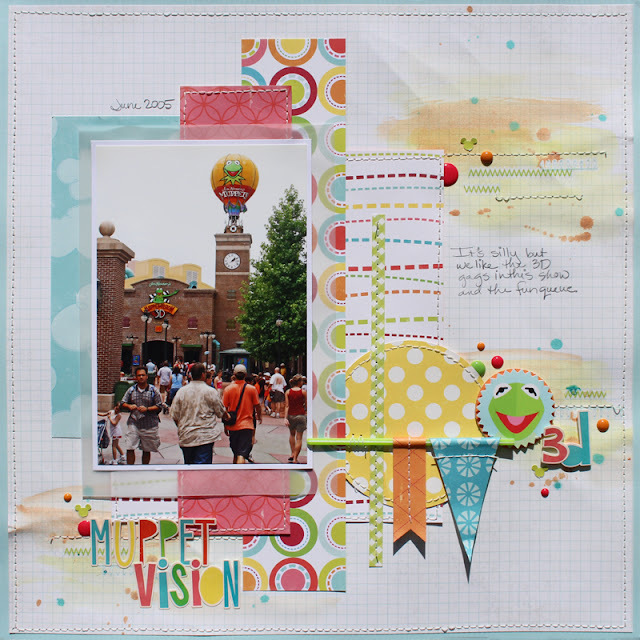 This is for last July's Sketch challenge at Disney Scrappers. Today I have to share two of my favorite layouts. Both of these are photos of Spaceship Earth at night. The colors are amazing so I just love scrapping them. The design of Spaceship Earth is perfect for a cut file background. 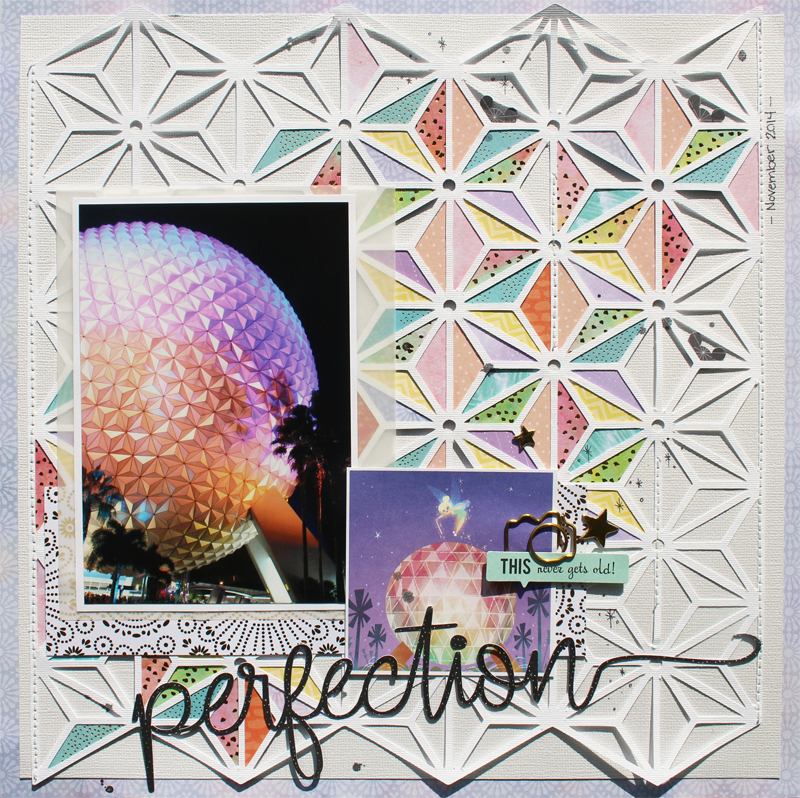 For the paper pieces I used papers from DCWV Watercolor stack and the Peri and Peach stack. 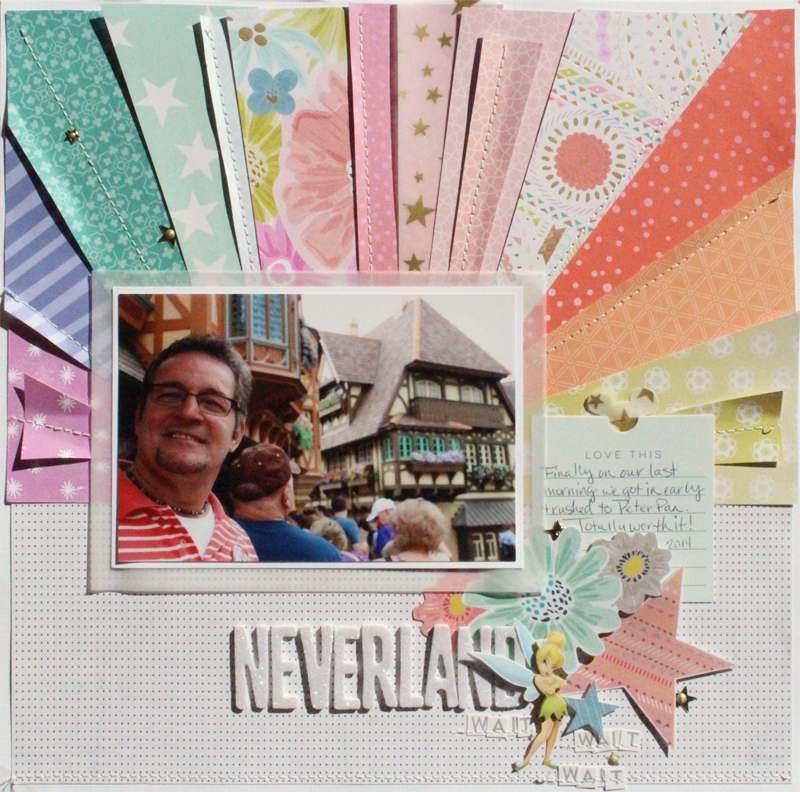 The little tinkerbell image is one that I found online and printed onto cardstock. 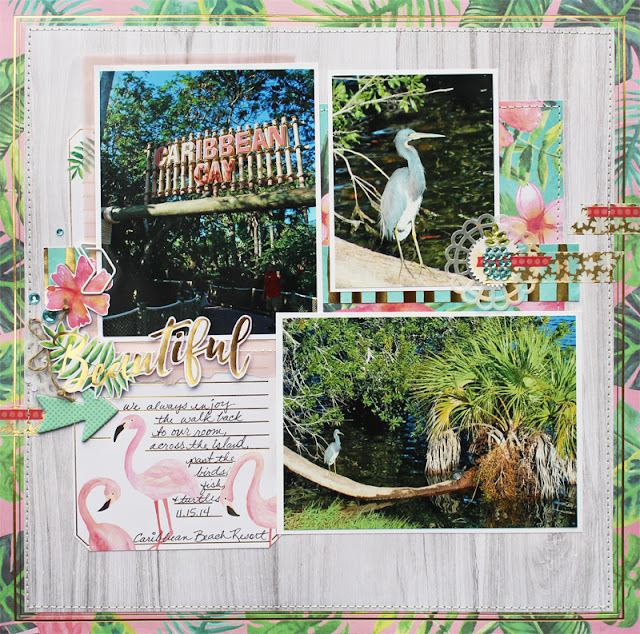 For this page I used background paper from DCWV LeBlanc stack and I used some inks with a sponge to add a bit of color, the design acts like a resist. The gorgeous holographic and patterned papers are from the Zodiac Stack. 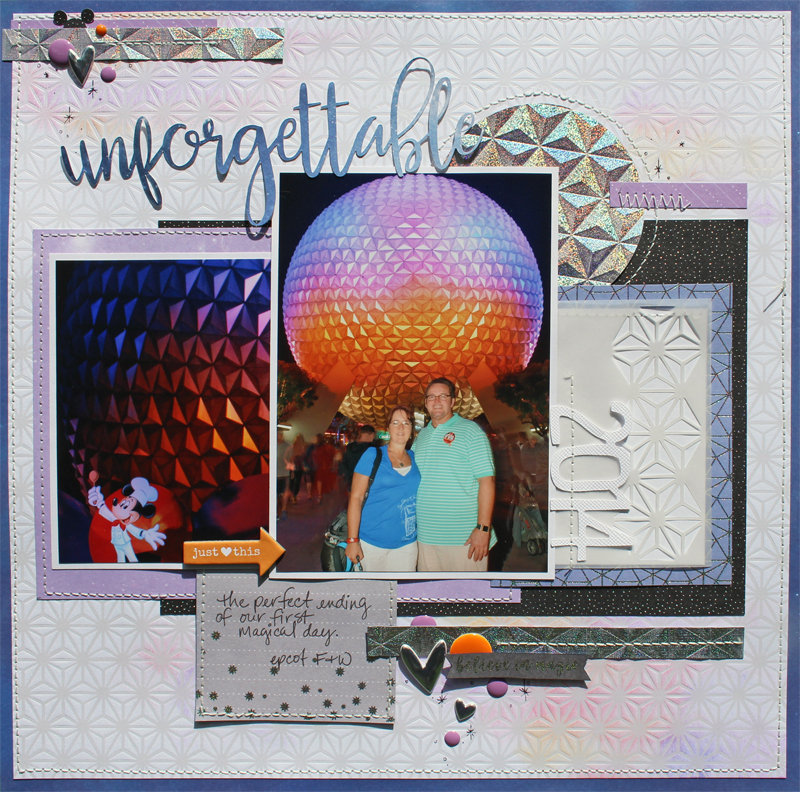 I used a 3D embossing folder from We R Memory Keepers to emboss the paper just like Spaceship Earth. Under the 2014, I have a piece of vellum that I cut some of the design out of, using my silhouette. This place is pure magic and I love this photo so I wanted a fresh cheerful page. 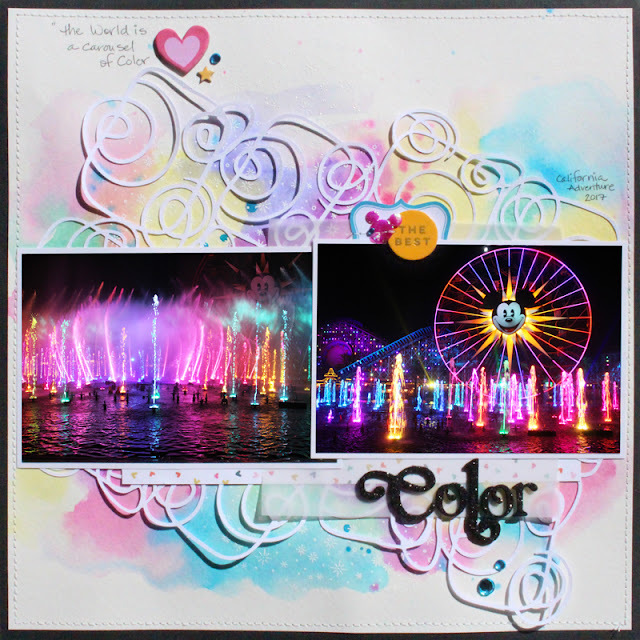 The cut file is one that I created as an exclusive cut file for the White Glove members at Disney Scrappers last year. The papers are from the Crate Paper Oasis collection and the gold dot tissue is just from the wrapping paper section of Target. lol. 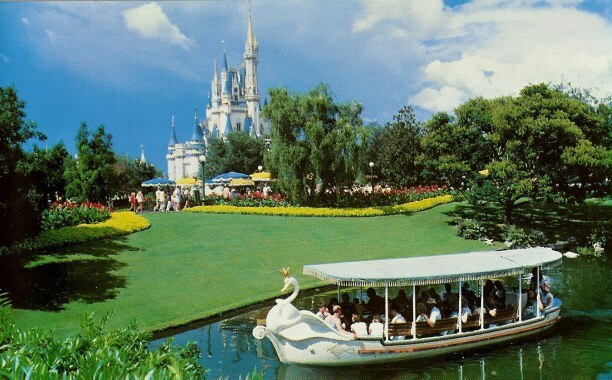 I had to include the image of the swam because there used to be a swan boat tour around the castle. We never took the time to ride and then they were removed in 1983. But I found this image online. While we were away on vacation, two of our boys were house sitting and taking care of the kitties. We got these storm troopers for them. Perry was doing some jedi mind tricks. I dug way back in the stash and found this gorgeous Basic Grey Pyrus collection and I kept the cool tag from the box to use on the layout. 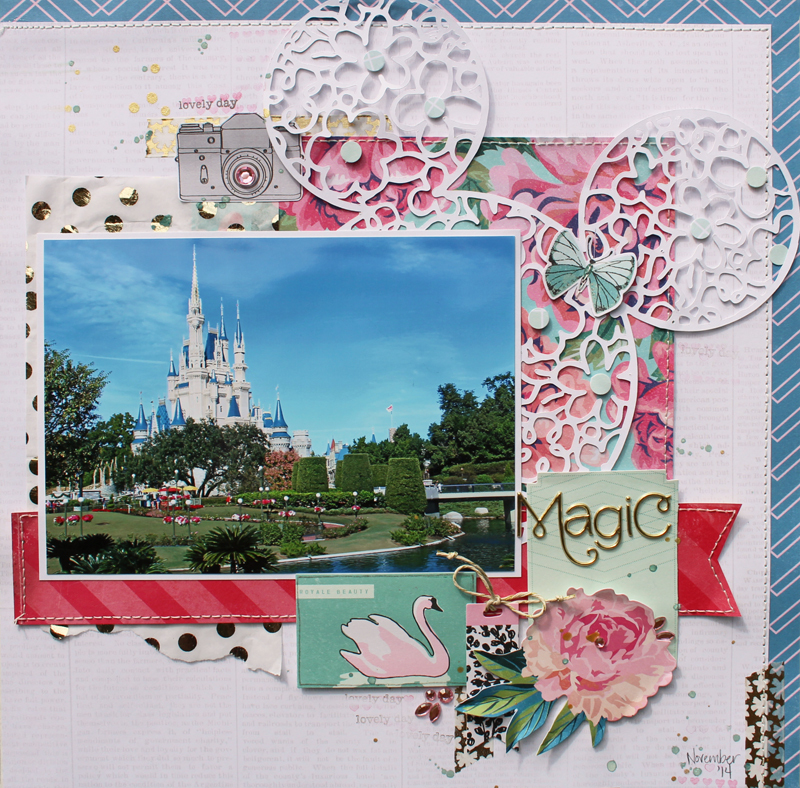 I used a cut file that I created for Disney Scrappers with the imperial symbol on it. Breakfast at the Contemporary Resort at Chef Mickey's before going to the Magic Kingdom on your first morning when it opens is magical. Even though it is called Chef Mickey's, I will tell you that Donald would have you believe that he is the head chef. 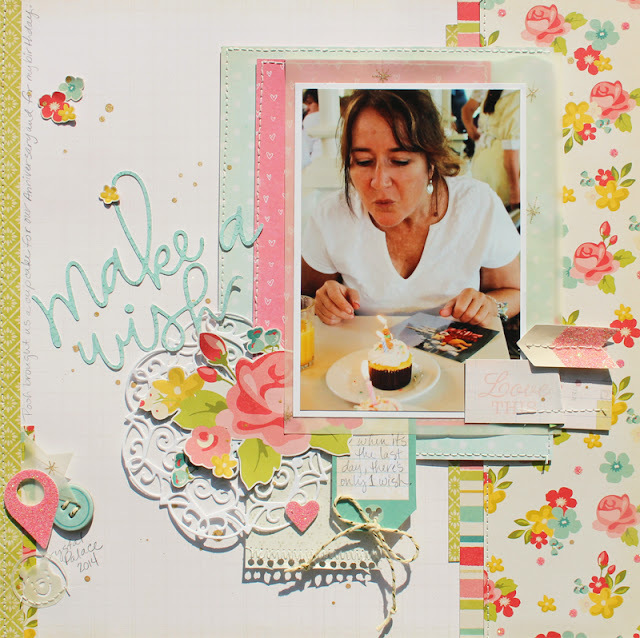 For this page I used my favorite older collection by Echo Park "Sweet Girl". 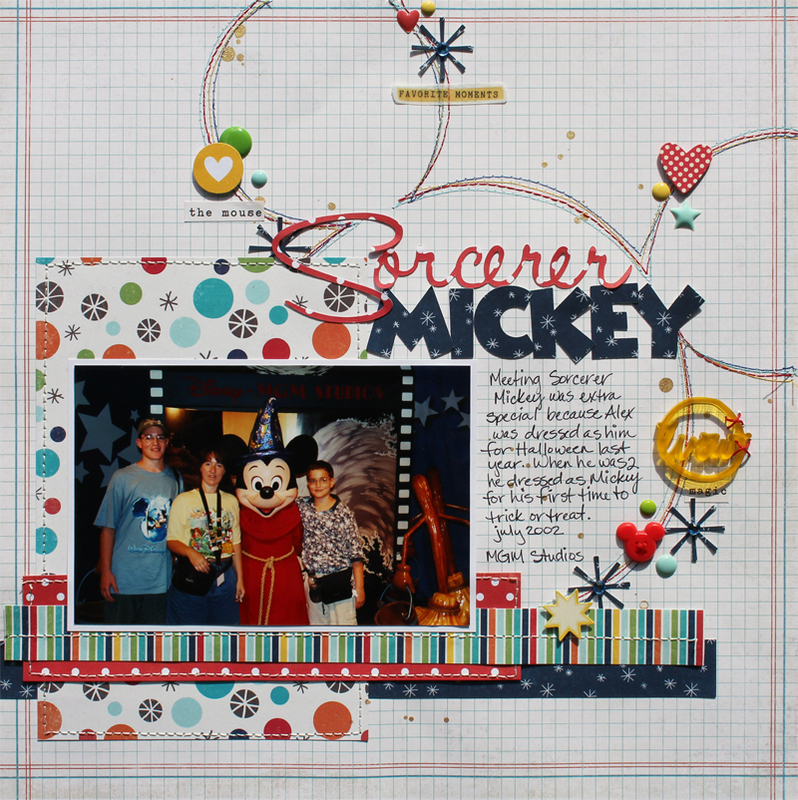 This page is my example for one of the exclusive sketches at Disney Scrappers. I created the pie pieces with uneven triangles and attached them to a scrap of paper to create the circle shape. I machine stitched a spiral on the pieces before attaching them to my layout. Happy St. Patricks Day everyone! I hope you are having a fun day. I tried to find a very green layout but this topiary page was the best I could do :) Last year I decided to try to finish scrapping my 2002 Disney Vacation so you will be seeing alot of old photos scrapped from that trip. 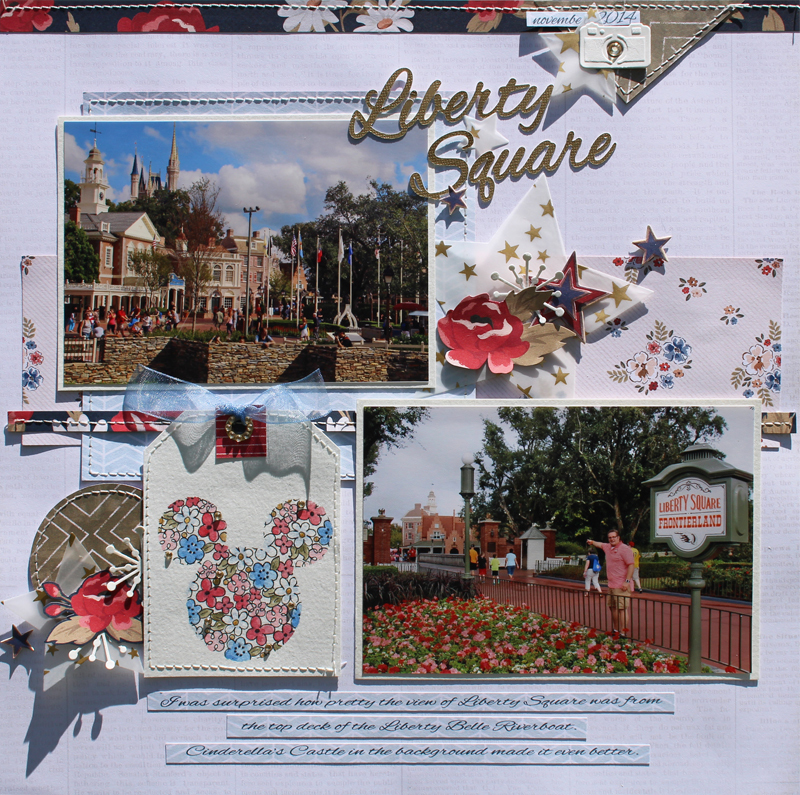 This one is a couple of the beautiful topiaries from MGM Studios. I used the Summer Lovin Collection by Carta Bella Paper. Its got the best summer colors. I punched a bunch of confetti and glued it to the edge of my journaling spot. I think confetti is very theme park. 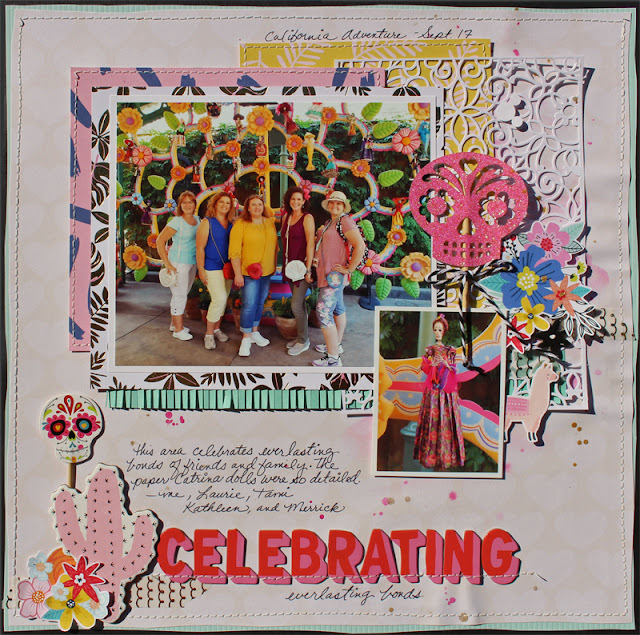 I cut out the big flowers from patterned papers, layered them and added glitter. 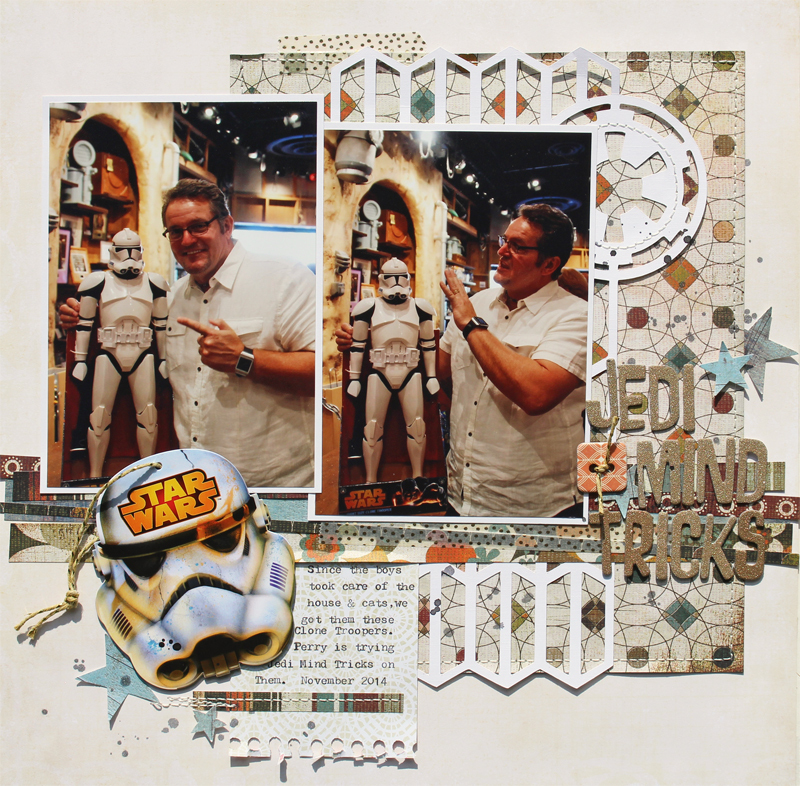 And then a couple of weeks ago I decided to scrap the photos of me to finish this layout. 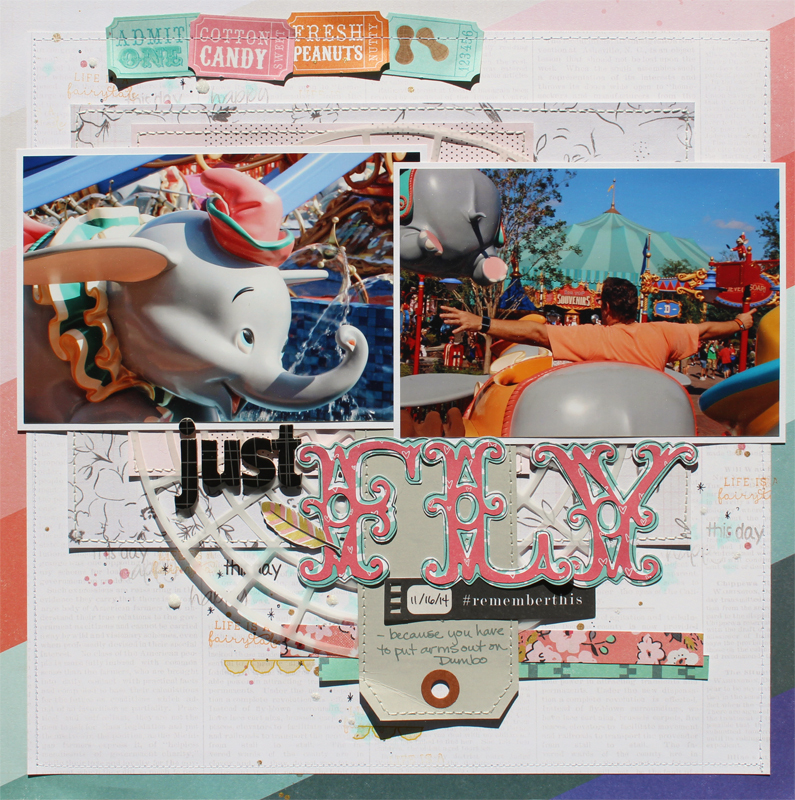 I used some Gather collection to tie it together and added some Carousel collection. The yellow and turquoise bunting are stickers over a pink vellum bunting that I just punched with a scalloped edge and fringe cut. This layout is one of my fave views at Epcot, I just love the look of the Imagination Pavillion and I love Figment. I papers mostly from DCWV's Sweet and Sassy stack because the colors are so fun and there are tiny bits of gold foil in the patterns. The triangle print got my attention right away for these photos. I fussy cut some flowers from a paper from another collection. 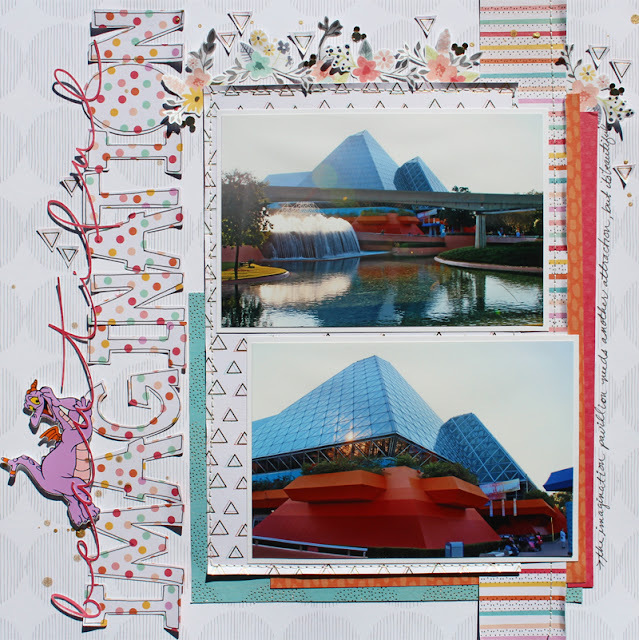 For Figment, I found an image online and then printed him onto photo paper and cut him out as an embellishment. 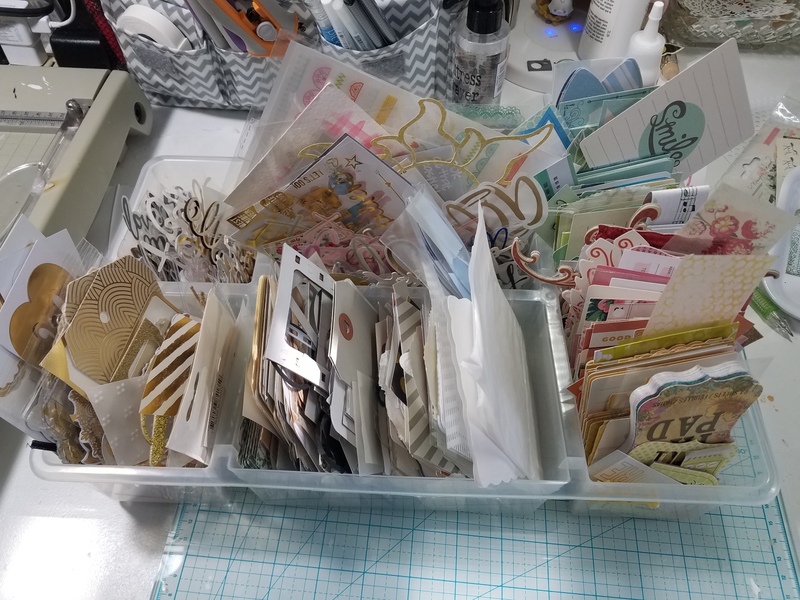 About a year ago I decided that I never use my die cuts, ephemera, chipboard, etc... because out of sight really is out of mind. I do have my embellishment stand and I still have ALOT of embellishments there but I pulled out any ephemera packs and anything like that where it could be organized by color. After a year I am very happy with the way it is working out so I thought I would share. And if I have already shared this somewhere, sorry...I have a terrible memory. LOL! This is three sectional boxes organized by color and I was confused by flowers that are usually multi colors so they go their own spot. I love these because they have lids and close to stack and to take to a crop. and this one is the divided container that some of you might have from IKEA. It fits in the Raskog carts that everyone has. There is no top so spilling this would be bad, LOL, but its the only way you can divide up all of the larger 3 - 4" paper embellishments and journaling blocks. I also have lots of script word titles in here. Today I am going to share 2 layouts. The first one is Monkeying Around with photos from our 2014 trip to DisneyWorld using the super Toy Story looking Toy Box collection by Carta Bella. I will admit that I struggled with these bold patterned papers. I so wish all collections had some light neutrals to tone down that strong papers. I used a background that looks like a word search from another collection and I added a light woodgrain paper. 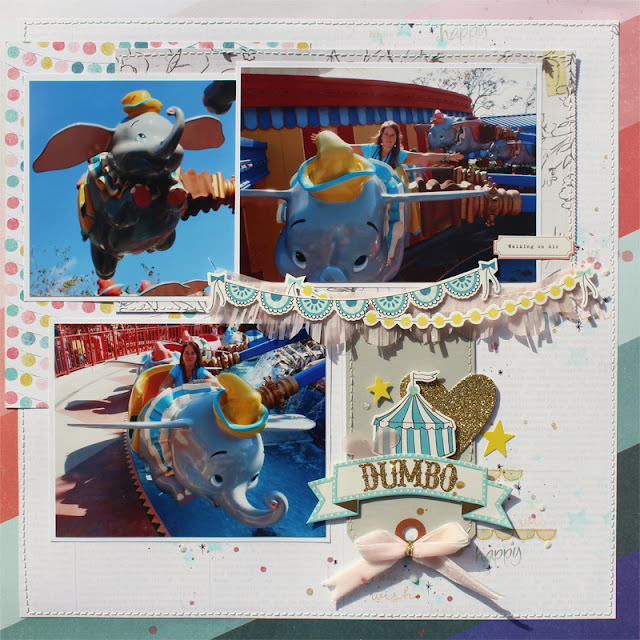 The monkey embellishments are chipboard and sticker, but how perfect are they with my photos! I am noticing that posting these layouts that I did a year ago is fun for me too, I had forgotten how great that collection is. I need to do some more pages. 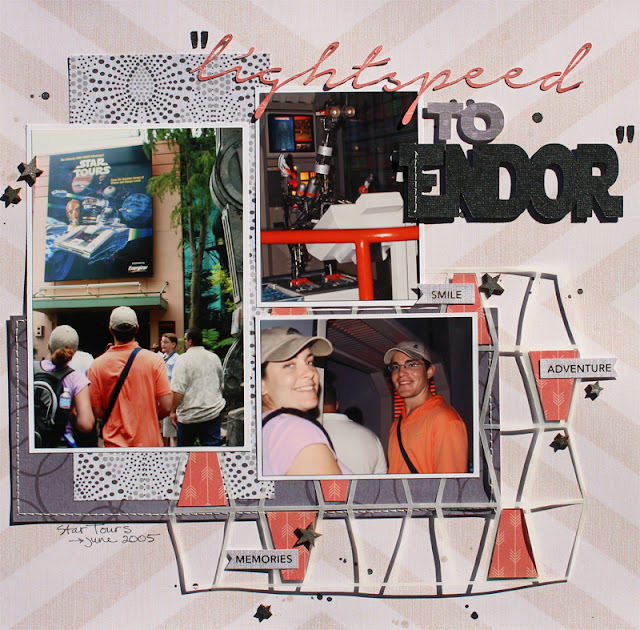 This next layout is from our 07 trip. These are the last photos I took as we were leaving our beautiful resort. The guys were exhausted but I am never ready to leave no matter how tired I am. I am trying to use more and more of my older stash and for this one I used papers from a couple of different paper stacks from Recollections I think. I struggle with scenes printed on 12x12 as a background but the palm paper cut as a strip worked perfectly for my page. I have pulled most of my die cut, chipboard, and ephemera elements and organized them by color so that when I do a page like this I can just dig thru the colors I am using for something like the chipboard words at the top or the hearts at the bottom. As I said before I haven't taken close ups of most of the layouts that I have finished in the past year because I didn't share them here and I don't remember all of the details but I will do my best to tell you what I can. 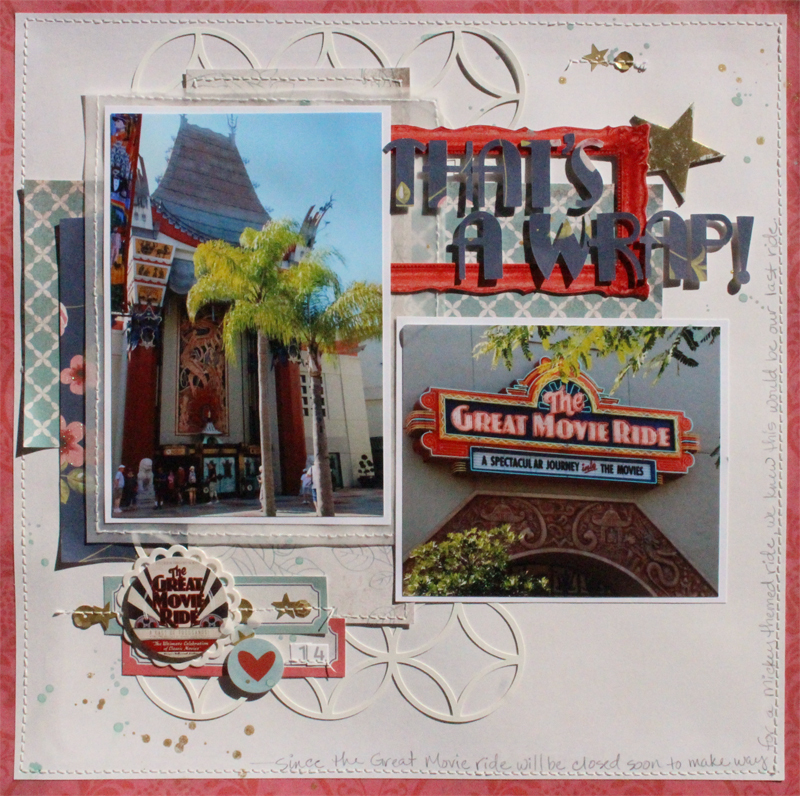 For this page about Space Mountain, I used DisneyScrappers Sketch #4 during our INSD week crop and Echo Park's super cute Space Academy collection. I added journaling with my We R Memory Keepers typewriter. I love having multiple colors of ribbon for it but its kind of a pain swapping them out over and over. I seriously need to do that more though. One tip though, you cant really put layered papers thru the typewriter so mark off where you plan to journal in pencil before attaching anything to your background. Hello out there! I haven't posted in almost a year and I am not sure if anyone is even going to see this after being gone so long. But a couple of people in my family have mentioned that they check my blog and my mom shows friends because of photos, which I suspect doesn't look too great since I haven't shared any pages. LOL! 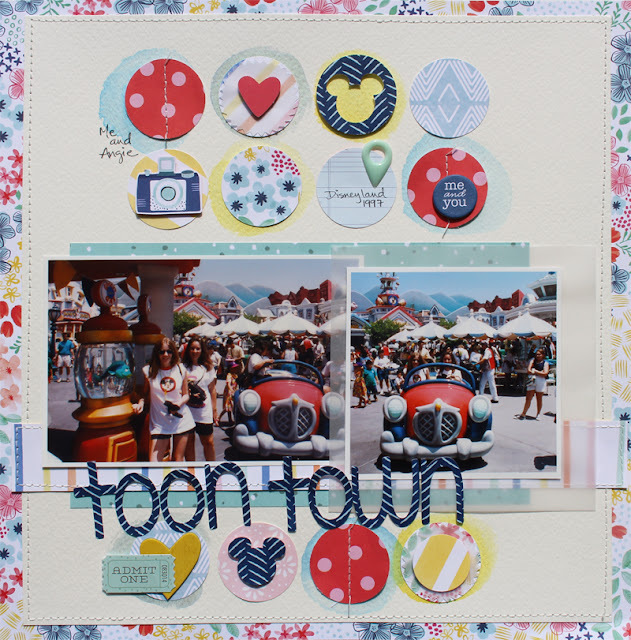 Here is the thing, I have been just scrapping Disney pages mostly and so I have been sharing my layouts over at our DISNEY SCRAPPERS site. 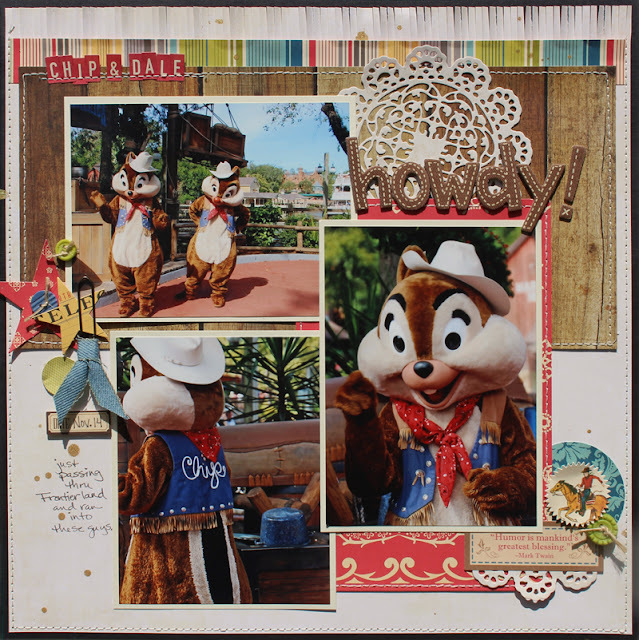 Well recently I have done a few non disney again as well. I thought since International Scrapbook Day/week is coming up in May, I would set a goal of posting all my layouts here between now and then. It appears that if I post a layout or 2 every couple of days I can catch up. Since I rarely do 2 page layouts I thought I would start with this one that I did last may. I used Basic Grey Hillside. 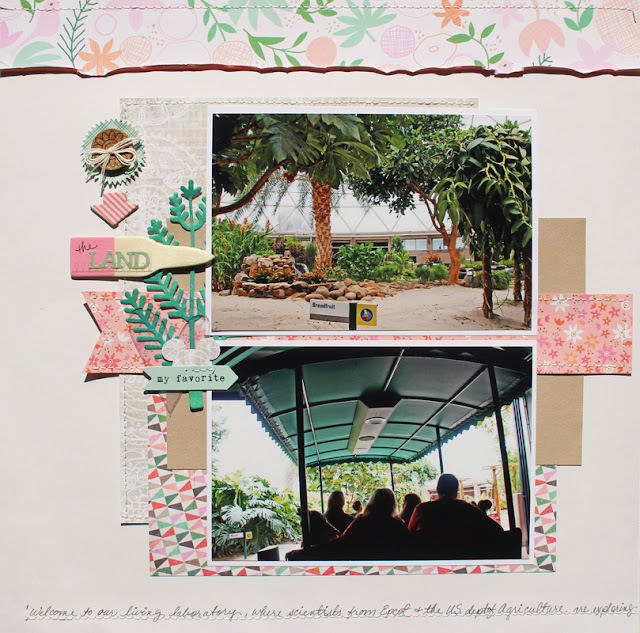 If you are like me and you don't do well with 2 page layouts, think about using the same papers and embellishments to create two seperate layouts and then just put them together and they will at least coordinate. I kind of did that with this one. I made sure I had a strip along both tops and one strip in the center and the rest is all kind of individual. 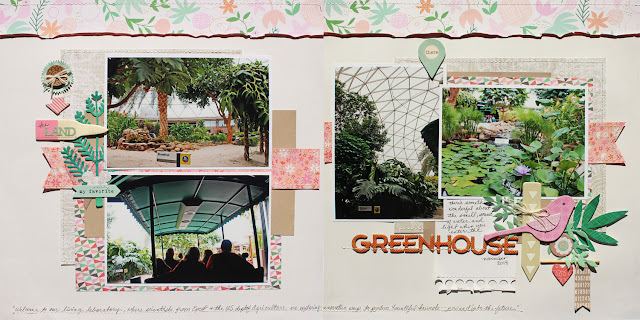 I have to add that while I haven't been sharing on my blog. I have not taken close up photos very often of the details but if you click on the images, some will be shown larger. One of my favorite stacks from DCWV is the Gilded Grey Stack. Its very monochromatic really but it solves alot of scrappy problems for me. 2 of the hardest things for me to scrap at disney parks are anything StarWars and also Rock n Roller Coaster. The black, white, grey thing is a struggle but with this stack you get alot of great designs, good shades of grey and neutrals and that pop of gold. 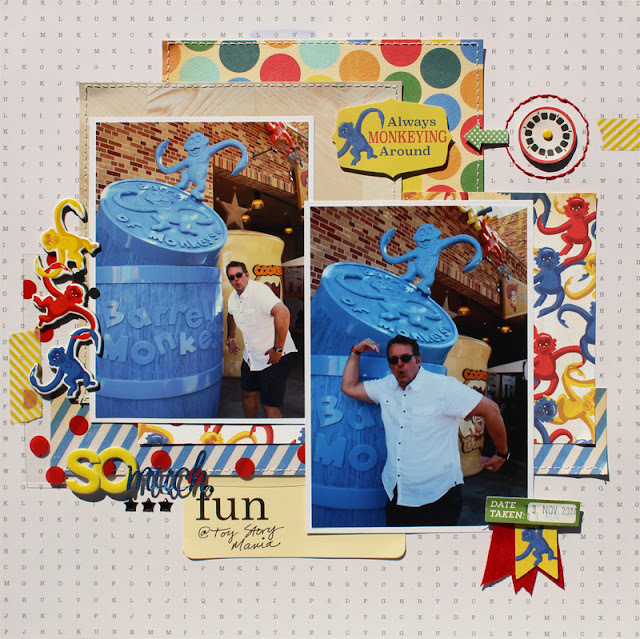 Here are 2 pages I just did using this stack. This one is Star Tours and I was using indoor and outdoor photos, but the hardest part is my son's very orange shirt. I used the Gilded Grey stack and also a red orange paper from one of the other stacks in my stash and it was just that extra pop. This page is a makeover of an old page from my 2002 album. For some reason I had 12x12 for 90% of that album and then there were some 8.5 x 11" so those have to be remade in the other size. 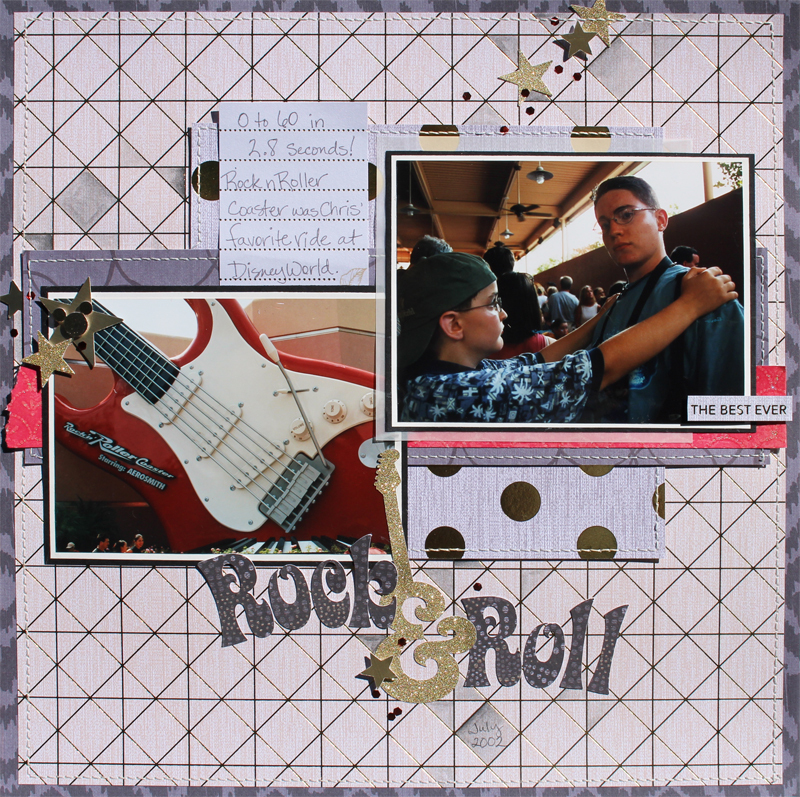 This is Rock n Roller Coaster so again its mostly the Gilded grey and I added a pop of red. for a little extra depth I added grey watercoloring in some of the background shapes.The title is a Silhouette store design. I know I haven't posted in awhile. 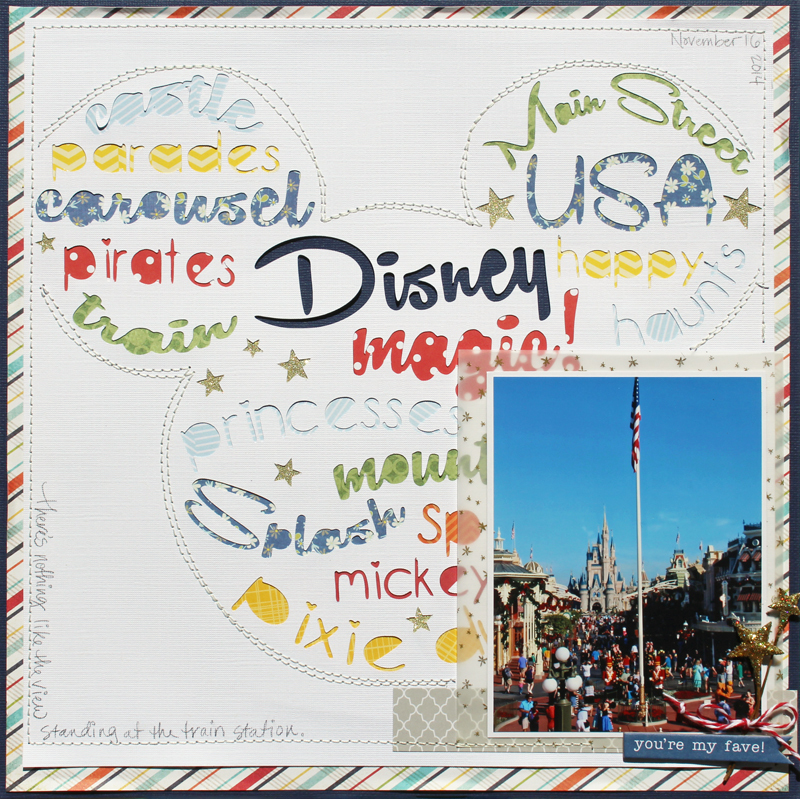 I have been super busy getting ready for all of the challenges at Disney Scrappers for the online InterNational Scrapbook Day Week long crop. Hows that for a title! We had a fantastic time scrapping and the gallery is full of amazing layouts from lots of members. If you would like to take a peek, check out the Gallery HERE. 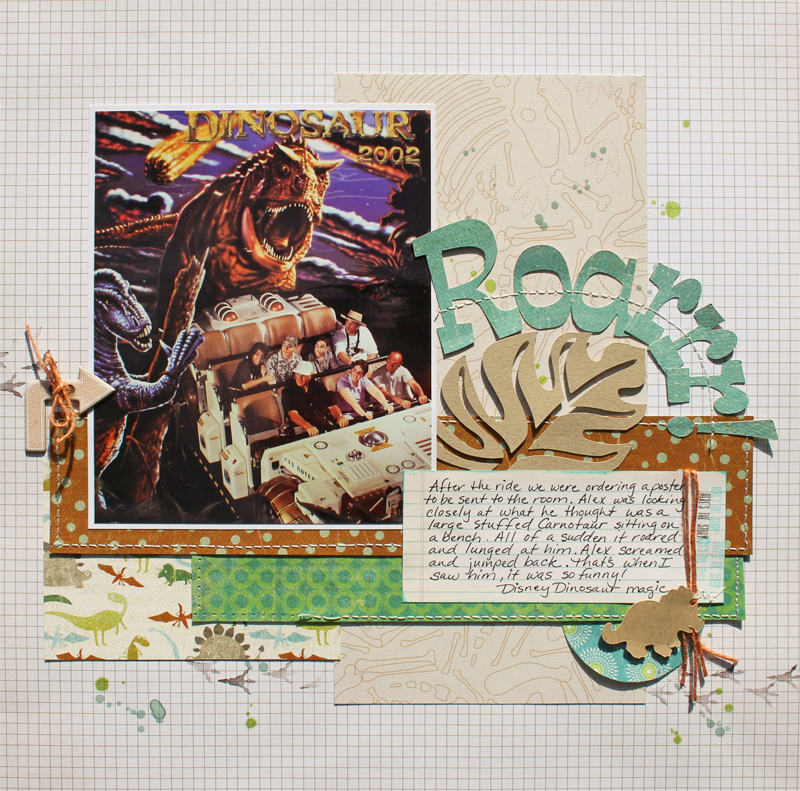 I would like to show you a few of the layouts that I finished as examples or participating in the challenges. This first one is my favorite because it turned out perfectly. 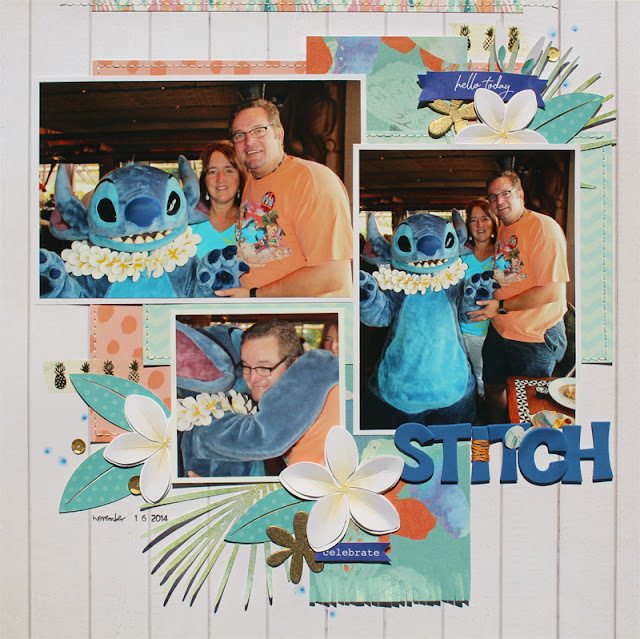 I used a collection of papers that I got at michaels called Paradise Crush and that paper actually had a bit of Stitch blue which is very rare. I cut palm fronds and Plumeria flowers using my silhouette. The plumeria is a Silhouette cut file. 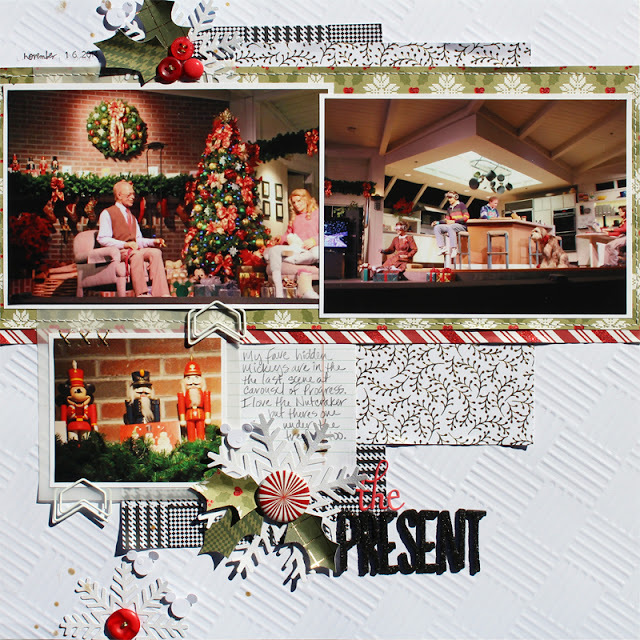 This one is another fun one with a confetti pocket and using DCWV Watercolor Ombre stack paper for the background and the other papers are actually from an older DCWV Holiday Whimsy stack, I think it was called. One of the challenges was to watercolor on the background and I had so much fun doing that on this page!!! I did actually use watercolor paper so it warped less. *ducky momo is a character on Phineas and Ferb and I just wanted a photo with him. LOL! 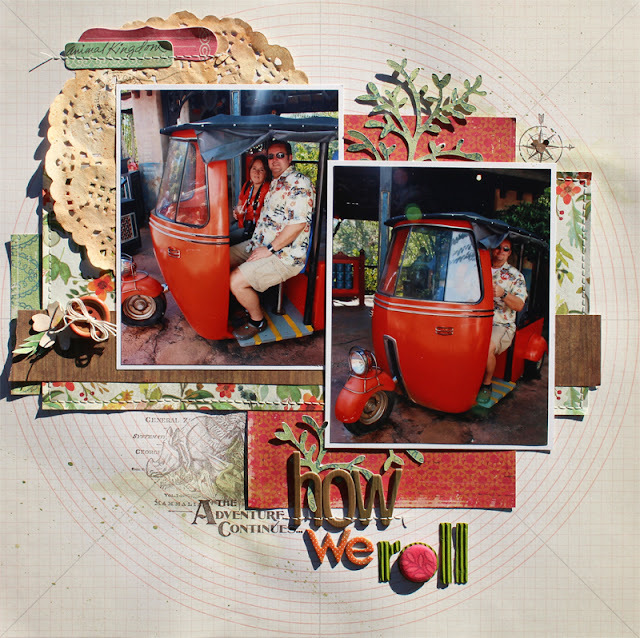 Another challenge was stamping so I did a little stamping and watercoloring on this one. This is another watercolor page and also a backstory challenge. Its a remake of a page that was originally 8.5x11 but that trip was scrapped 12x12 except for like 10 pages that now need to be rescrapped. I just love it because the boys were so little in '02.